Papayas are an excellent source of nutrients and vitamins. And itâ€™s quite easy to grow them, if youâ€™re in a tropical or sub-tropical climate. The business is perennially flourishing and is even increasing in profit nowadays because people are beginning to be health conscious. So starting a papaya farm is a fruitful enterprise that you can rely on for constant profit. The papaya (fruit of Carica papaya) is a tropical plant usually grown in tropical climates such as Mexico, California or any of the equatorial countries. It is a popular fruit in those countries as they have numerous health benefits that have been proven and tested by various scientific researches and findings. The papaya business has been a perennial source of income for the farmers in the countries that grow them. It even had increased revenue when people started buying green products and foods. The most usual clients of the papaya farms are the people themselves. They buy papayas directly from the farms in the knowledge that those bought in the farms are fresher and healthier than those bought in the markets. However there is a niche in the papaya that papaya farmers usually tend to forget or haven’t have had any access to. This niche is the medicinal industry. There are many companies that use papayas or derivatives of it to makes soaps, tablets, medicines and the like as an herbal supplement to foods. Although most business still has pending scientific adjudication on their products, it proves as a boom to the papaya industry. This niche alone contributes more than $100 million to the industry. The papaya business, because of its silent popularity with the masses, doesn’t really need much advertising. However, since you are to start a new business, it would be good to advertise at your local area first. Do it the traditional way, like flyers or free tasting of the papaya at the local markets. Advertise at the local newspapers. It is impossible for papayas to survive in climates that aren’t tropical. That is why it is suggested simply that if you want to start the papaya farming, do it in a tropical climate, like California, New Mexico, Texas, or any of the adjacent states that don’t have snow. If outside the country, do them in the tropical countries, like those in Southeast Asia, Central and Southern America. Location is a key factor in the papaya farming. Even though it may take you some time for the plant to grow, remember that the investment you give will be recuperated in a short time only, as the time it takes for the papaya to grow is significantly faster than the other farming plants. It doesn’t take that much for the business to start. Your first asset to purchase is obviously the land, which must be good, so don’t scrimp on the land. The price might be steep but remember that the land is very important for the plant. There are other costs, but one must remember that these will be recuperated in a short time. These are the essential steps you need to take before and during cultivation of arbi. By following these, you have a simple and yet effective guide in properly growing the plant. This way you can enjoy the starchy, sweet tuber of the plant popular in many countries in the world. Jalapeno farming has become quite popular, they are hot peppers, requires excessive sunlight and moist soil for growth. They grow to 3 feet height on an average. i would also like to know the financial aspects of papaya farming also how many trees is normal per hector and the average number of papaya per tree on good dirt? which type of soil does it requires and tenure of the crop and water salt level. im from the Philippines (Pampanga in Luzon), would like to know more about papaya farming. hope you can send me more information regarding this matter. thanks. I would like to start a papaya farm some way at Kuala Lumpur. Hoping that you will provide me more info about planting of papaya, financial aspect, how many trees per acre, profit, risk and so on...Thank you. i want to start a business of papaya in chapra. chpara is on of the district of bihar. i really want to start this business. that's why i need some information related to some thing which are given. Hi, I am interested on papaya farming. My resident location is Eastern Nepal. Please is there favorable climate? Please suggest me. Can you grant me some more information on papaya plantation as which seeds to use, when to start plantation what are the other cares required to do this farming. How will this work out if i go for 3 acres of land. what will be that approximate output on yearly basis. I want to start farming of Papaya. I have my own Land Nr. Godhra, Panchmahal, Gujarat, India. Please tell me what are the product we can make from papaya n it is benefited or not. I want to start a business of papaya farming in Vapi(South Gujarat).Can you grant me some more information on papaya plantation as which seeds to use, Which season is suitable ,when to start plantation what are the other cares required to do this farming. How will this work out if i go for 3 acres of land. what will be that approximate output on yearly basis. I want to start a business of papaya farming in Bijnor(U.P).Can you grant me some more information on papaya plantation as which seeds to use, Which season is suitable ,when to start plantation what are the other cares required to do this farming. How will this work out if i go for 1 acres of land. what will be that approximate output on yearly basis. Hi, I want to start papaya farming in PANIPAT (HARYANA. Can you grant me complete information on papaya plantation as which seeds to use, which season is suitable & when to start plantation. How will this work out if I go to for 3 Acres of land. What will be that approx. output on yearly basis. Thanks. i am in al ain u a e.i have a papaya tree .now it is flowering. i am waiting for a fruit. what should i do for that? hello sir am leaving in Maharashtra in Dist Gondia. i am starting papaya farm. but i don't know correct information. your help me. sell papaya...Papaya farming friends if you wants selling papaya Please contact to me. my contact no.08969271299/&/09386859596 and talk to me.Rakesh Roshan,dist:-PATNA,state:-BIHAR,INDIA. I am from Thiruvananthapuram, Kerala. I would like to know, How to choose the right seeds for papaya farming? I would like to sell them, once produced. Is India itself a good market? Can I export it? I have 17 acres (about 7 Hectors) land. I want to grow papaya first time. Pl give me complete method along with expenses and estimated income. i am from rishekesh(u.k).I WANT TO KNOW ABOUT PAPAYA FARMING AND CROP IN PER TREE OR TOTAL COST ON PER TREE. i want to know about the papaya farming, i live in saharanpur (u.p).i would like to know the name of papaya variety which i will get maximum production and actual time for cropping and the about the caring of tree. Sir, I am from Visakhapatnam, andhraprades, india, I would like to start a papaya farm in 5 acres of land, what is the strategy to be followed, is it better to start in 5 acres at a time. DEAR SIR, I HAVE 17 ACRES OF LAND IN GURGAON .RIGHT NOW WE HAVE AROUND 25 TREES OF DIFFERENT MANGOES AND GROW VERY GOOD QUALITY VEGETABLES AND WHEAT FOR OUR HOME CONSUMPTION. SINCE WHEAT CROP IS NOT VERY PROFITABLE SO I WANT TO START PAPAYA FARMING. PLEASE ADVISE WHICH SEEDS TO USE, HOW TO GIVE WATER, WHICH MANURE TO BE USED AND WHAT SHOULD BE THE DISTANCE BETWEEN TREES. CAN WE ALSO DO POTATO FARMING IN BETWEEN THESE TREES. i have land 10 acres in thatta district sindh pakistan. i grow wheat, cotton and sweet potato on tubewell water. can i start papaya farming on tubewell water? if yes than suggest what kind of seed to be used for better yield. @prakash, Hi Prakash, Here are some facts on growing papaya that might help you. Papaya is first growing fruit plant. You can grow papaya from seed and seed will grow within 5-7weeks. You can get flower within a year. It grow in high temperature. Most harmful things for papaya plant are soggy and frost soil. slightly acidic, light, well drained soil is best for this plant. Keep the soil moist in summer. You can feed once a month in summer with a balance liquid fertilizer. Make sure plant is getting proper nutrients. For avoid root rot the plant should be keep on dry side on the other hand the plant need more water for support their larger leaves. @amit chadha, Hello Amit, It is a good idea for growing papaya. papaya is fast growing plant and it is really easy to grow. It will give you fruits all the year. Here are some tips for you. You need good well drained and full of nutritious soil, lots of sunlight, frost free climate for growing papaya. If you will use local grown papaya seed you can get best result. Papaya tree need full of nutrients and organic soil. if you do not have good soil not to worry you can use lots of compost to your soil and make it good enough nutritious for your tree. The main problem for growing papaya is strong wind. As they have very thin root and heavy top so that strong wind cause the papaya disaster. Replant is the only solution of this problem. Pick the papaya when they start change color else birds and fruit bats will destroy your papaya. I am situated in Dehradun and I have a land in Selaqui area in Dehradun. I want to start a papaya farm kindly guide me what should i do . My land is fertile enough as it has all agricultural activities around the land . Mainly sugarcane,vegetables and wheat is grown in that area . Water is not a problem after boring a tubewell . It (the land) has three tubewells around the distance of 500 mtr , one is government owned & other two are privately owned all running well . Also guide me if there is any subsidy granted in this farm . 1. Does the farm / plants need to be covered . 2. Do birds harm the plant . 3. where could I get the best seeds . 4. Any other specific Fertilizer need to be put in the plants . 5. Also where could I get the expert guidance for plantation of papaya. Thank you , Paras Bhatt , 105/1 , vasant Vihar , Dehradun , Uttarakhand . Pin - 248006 . Phone - 0-9412051160 . I think no need to cover the plants. Of course birds will harm the fruits so the only solution is pick the papayas as soon as they start to change colour. TheÂ main problem for growing papaya is strong wind. As they have very thin root and heavy top, strong wind cause the papaya disaster. Replant is the only solution of this problem. Usually papaya need good soil, which should be rich in organic matter and nutrient enough. If you do not have good soil you can add compost to your soil and make it good enough nutritious for your tree. Sir i am form Patna(Bihar) i want to know about the procedures as well as best seeds and irrigation system, marketing, temperature, and very importantly making them save form insects... Thank You! hey any consultants/interested to do contract farming.. please contact me asap. I have few acres near hyderabad, interested in papaya farming, like to invite anyone already in to it or newly interested to do contract farming & share yields, please contact me at my email kumabi@msn.com. I'm from Pakistan. What is the per acre or per ha fertilizer requirement of papaya plant for an optimum yield? I am a student and i have some land in Allahabad, U.P. India. I have only 10000 rs. Can i start the farming of papaya? How. I'm P Singh from BHIWANI (HARYANA)has desire to grow papaya on 20 acre land please guide me how to grow papaya from where I will get seed require complete literature from A to Z please guide me from where I will receive cheapest seed and fertilizer. is there some subsidy provided by the government of Haryana I have desire to do papaya farming on commercial base also want to grow dwarf type plant plz do the needful. Red Lady Papaya (786 Taiwan)We provide complete solution for Papaya plantation. If you need more details can contact me on +919743650283. dear sir/mam, i've been planning to start a papaya farm in 10 acres of leased land. besides paying lease yearly,i have to earn enough to make good profits besides huge investment for the entire 10 acres.i have heard that extracting milk from papaya fruits for pharmaceutical purpose can earn good profits.could you please help me in finding the addresses of the buyers who buy the papaya extracted milk.i will be very thankful if you help me with the addresses.thank you. hai, this is manjunatha from small village chikkandavadi in karnataka state. please give details of red papaya plants. i am andrew from Philippines. 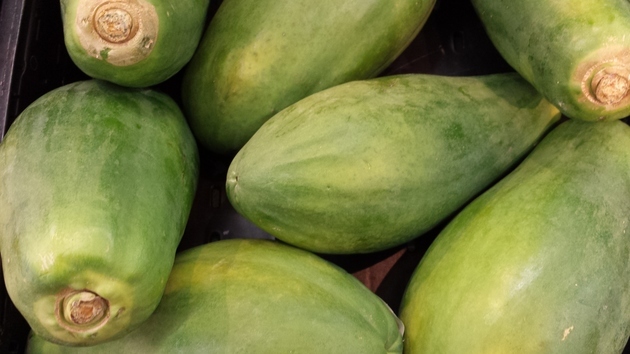 We have a nice variety of papaya called SINTA papaya. It is moderately tolerant to papaya ringspot virus (PRSV) and produces more quality fruits than the ordinary papaya strains. It is semi-dwarf and therefore, easier to harvest. â€˜Sintaâ€™ is early maturing and prolific, which bears 17-50 fruits per tree. Its fruit weighs 1.2 â€“ 2.0 kg, is sweet and has firmer flesh. If you are interested of having a seeds with good quality you may call me at +639194726855 or you may email me at andrew_delacuesta@yahoo.com for more information. Hi,i am G.p.singh my location is distt-Aligarh ,Utter Pradesh,India. I need detail regarding red lady /you know variety papaya cultivation, i like to do in 2-3 acre of my land on trail basics. Where can i get seed and other things ? What are the scheme & subsidies for drip irrigation and other maintenance ? Requires details of package of practices of red laddy papaya and cost of cultivation ? i want to start the papaya farm near sonepat.who can i start and how much money for one acre. WE WANT TO CULTIVATE PAPAYA IN SEMI HILLS OF HIMACHAL PRADESH. iS IT FRUITFUL? IF IT IS THEN IS THERE ANY SUBSIDY ? i have papaya plants. who is the papaya fruit buyer in mangalore or puttur. pls send me the details.thax. sir. i want to start papaya farming in 2 hact. i want to know proper harvesting time? i have planted few papaya trees in my kitchen garden.some of them are getting infected. the fresh leaves get pale and yellow.the plants are four months old.it has started flowering. what treatment should i do? Hi, I have started papaya farming from last 4 years Nanadurbar district of north Maharashtra and i have good profit from it but i want to export my crop please guide me for the same. I want to start Papaya Red lady farm in Rajasthan. I need hybrid seedlings. Could you please intimate by e-mail that when and where I can get it. Thanks and regards.